The Protists Worksheet – Download the FREE printable science for kids words game. 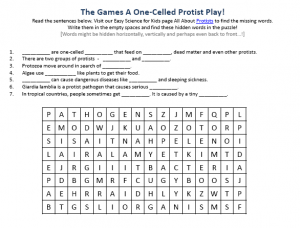 This free kids words game about Protists includes a fun hidden and missing word puzzle as well as a find the words seek game. The Protists fun facts worksheet is free to download and print. Kids from Pre-K up to Grade Five can enjoy this worksheet and learn fun facts about Protists. Grade school kids can enjoy this free fun facts about Protists worksheet as a reading comprehension activity. Children will learn very well and improve their reading skills, because they’ll need to read and re-read the facts about Protists to discover what the missing words are. Next, they will have fun finding the hidden words in the hidden words game. Kids in Preschool & Kindergarten who can’t yet read and write, can enjoy this free science kids words game as a listening comprehension activity. Educators can read the fun facts all about Protists out loud and then help their kids find the hidden missing words. The words search game is also a good way for young kids to learn to recognize letters and words. Parents can use the fun Protists worksheet to do early learning activities with their kids or homeschooling activities. Parents can spend quality time teaching their kids about Protists and making learning science fun. Teachers can use our free kids words game about Protists to supplement science lessons and interest kids in learning easy science facts about Protists. Educators can use our Protists free printable science worksheet for after school activities and child enrichment programs. EasySCIENCEforkids.com offers many great free printable science words games and free to download easy science activity sheets for kids. Download and us our animal facts worksheets and make it fun to learn about animals for kids! Protists are neither plants nor animals. These unique one celled organisms are microscopic life forms that can be harmful to humans because they can cause diseases. Although Protists can be harmful, they are also useful, as they decompose objects well and supply oxygen for the planet! What do Protists look like? Download this free printable science for kids words game to learn fun facts about Protists! Download the FREE Protists Worksheet for Kids! Do you like the FREE Prostists Worksheet? Read lengthy information about Protists here. Declan, Tobin. " Protists Worksheet - Free Printable Science for Kids Words Game - ." Easy Science for Kids, Apr 2019. Web. 25 Apr 2019. < https://easyscienceforkids.com/protists-worksheet-free-printable-science-for-kids-words-game/ >.